To get me in the mood for what I'll be enjoying in a few weeks. November 19, 2015: Following the success of the new brew setup and batch of beer I made, it was time to make another creation in my kitchen. 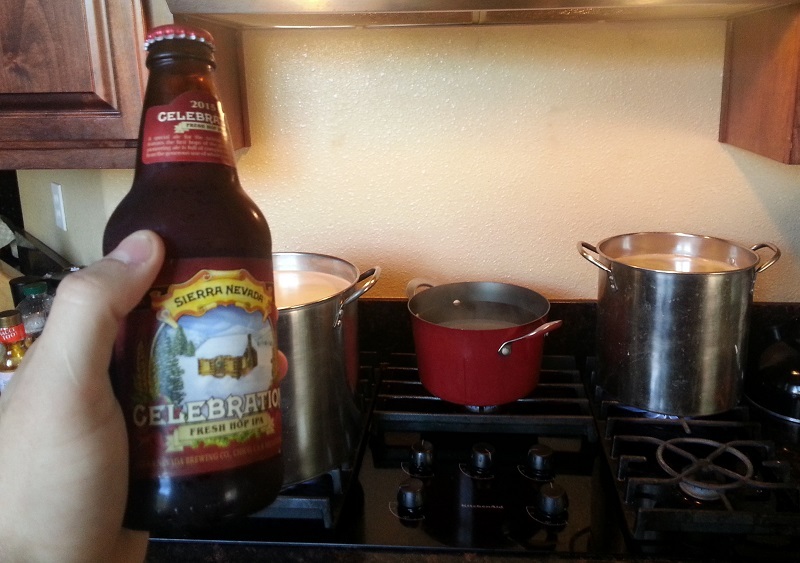 Since it is winter, I decided I wanted to attempt to emulate one of my favorite seasonal brews from this time of year: Sierra Nevada Celebration IPA. I found a recipe lying around on the internet and set to adapting it to my kitchen. 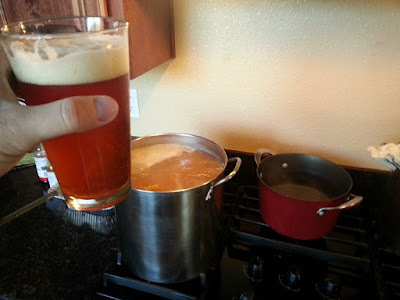 This IPA clone recipe calls for a total of 13 lbs of grain and 3 oz of various hops (see below for recipe). My buckets can easily handle that volume of grain for the Brew-in-a-Bag in a bucket method I've been doing, so it was no big deal. Getting the wort back on the stove was a nonissue. It was at this point where I thought ahead to boil up some extra water for topping up. I had a feeling that one of my ingredients (which I discuss below) would stop me from transferring all of my wort to the fermenter. At this time of the boil, I cracked open my bottle of ale. Aside from being refreshing, it was a good reference to know what I was making and what ingredients would be doing what. Ken Grossman would be disappointed in my though, as I used hop pellets instead of fresh hops. My recipe called for using some Irish Moss. I've never used it, but after throwing 1 whole tsp into my boil, it's fairly obvious what it did. All the proteins from the mash dropped out of solution like a rock. pictured below is one of my kettles cooling down in the sink. All the trub formed up in a lump in the bottom. Due to all this trub, I had to bring out my siphon to prevent too much trub from entering the fermenter. I think too much ended up getting into my batch. 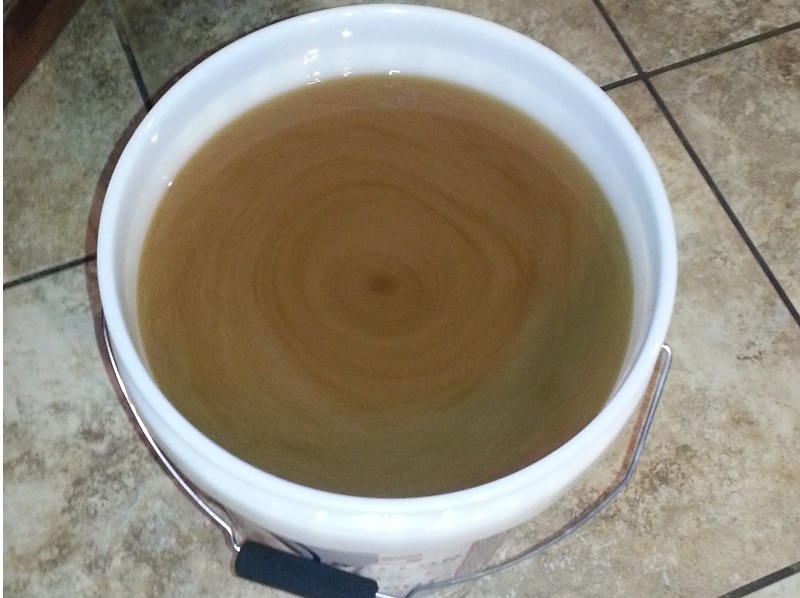 When I noticed that about half a gallon of sediment pooled at the bottom of the fementer prior to pitching my yeast, it was fairly obvious. I doubt that will affect the flavor too much. After getting my brew in the fermenter, my adjusted gravity reading came out to 1.057. 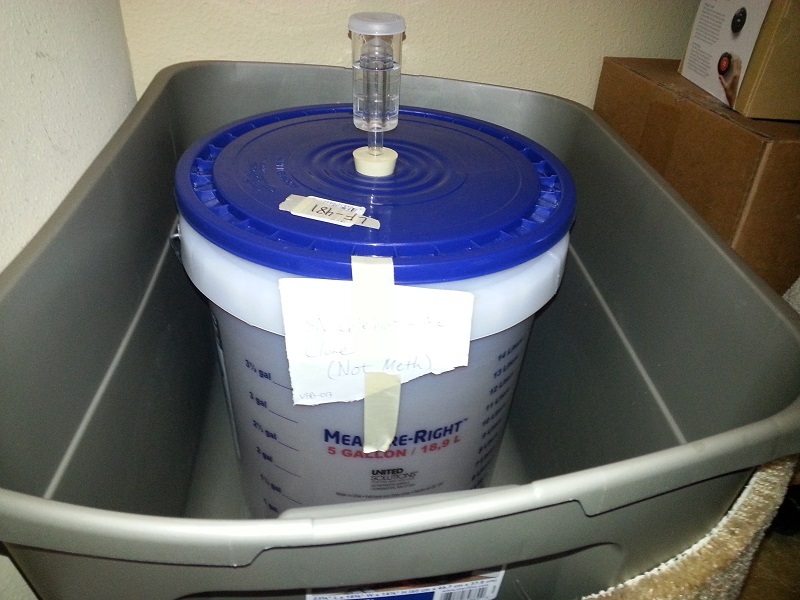 If it ferments down to the area of 1.010, it will be 6.5% ABV. The actual beer itself is 6.8% ABV. So I got fairly close to that target. Unless of course, all the sediment threw off my gravity reading. This will ferment for 2 weeks before I transfer to secondary and dry hop it a few days later. Expect an update then. Until that happens, I'll be enjoying my Winter Rye Ale. Cheers!